Fluorescent Yellow 131SC is a highly concentrated liquid dye designed to easily find leaks in hydraulic systems, engine blocks, oil filled heat exchangers, improperly seated gaskets, and any other leak detection application that requires the use of petroleum based fluids. 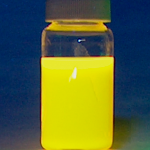 Fluorescent Yellow 131SC is readily soluble in most oil and petroleum systems and the brightness and fluorescence of the dyes allows for easy detection with ultraviolet light. After it circulates, dye escapes with oil and remains at the site of all leaks. When scanned with UV light (300nm-380nm) , the dye glows bright yellow-green. The dye has high thermal stability and will typically last for the life of the lubricating or hydraulic oil in the system. In this manner regular inspections will readily detect future leaks. Nova recommends using 100-500 ppm in engine oils for optimum detection of leaks or seeps in engine fittings. In the automotive application 1oz (30ml) of dye is added per engine (5 quarts oil or 4.7L). Nova is an independent manufacturer of Yellow 131SC and provides it in 5 gallon pails, 55 gallon drums or 275 gal stainless steel totes. Custom packaging is available on request. The dye is easily removed from metal surfaces with chlorinated solvents, parafﬁn oils or by dry wiping. Contact with concrete or plastic will impart a dark red color but excess dye can be removed by washing with soap and water.